SingleMomtism: Today Is National Single Parent Day! Show Some Love! Today Is National Single Parent Day! Show Some Love! Today is National Single Parent Day, and while that's a lovely commemoration, I highly doubt I'll be marching in a parade, or find a restaurant that offers a single parent special on the menu. 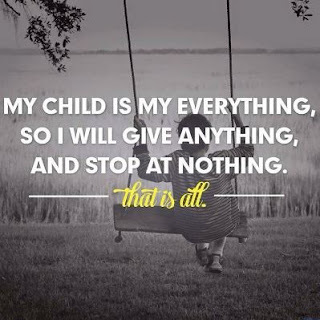 You may think there's not much to celebrate about being a single parent, and while it's not ideal (and not what I'd planned, certainly), it's not all bad. It's been seven years since my ex walked out the door. We've found our own groove, my kids and me. It's been seven years of weekend sleepovers in the living room, campouts in the back yard, movie nights and popcorn catching contests, new traditions and spontaneous hikes and picnics - mainly because that's just about all the social activity I can afford most days. It's been a lot of good memories, but yeah, it's not always easy. The last day of our beach vacation every year, I have a tradition. I don't eat. By then, we're usually low on money, and if I'm only paying to feed them, they get more dollars to spend at the arcade. Or maybe some ice cream. It's no big deal. I steal a french fry or two and I can hold out till we're back home. When my son broke his leg and ended up in a wheelchair for six weeks, I found out I can carry eighty-five pounds upstairs by myself on a nightly basis. And go without sleep for nearly three straight days. I've learned the value of having a job and an employer who understands, "I'm sorry - there is nobody else. She's sick at school and I have to go." More than anything, I've learned that I've got this - whatever this is. I have a faith in myself, a resilience I never realized, and despite the setbacks, I've done it. And I'll keep on doing it, because there's nothing I won't do to make life as beautiful as it can be for my kids. If you're a single parent, and you're reading this, rock on with your bad self. We may not get a parade, but we get all the love that really matters. I was a "single parent" before I officially became a single parent ( I asked for the divorce in 2008...because of 20 years of my ex's substance abuse issues). I received 0 child or spousal support over the past 9 years... (22 if you include the years that I was 100% suporting all of us) and I am more than ok with my situation. I have always told my children that "you are responsible for yourself and any children you bring into this world". I mean that with all my heart and soul! We need to teach our children to be resilient and not entitled.